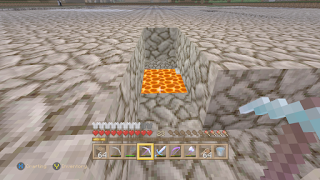 Welcome to Episode 12 of my Xbox Minecraft survival world. You can click here to catch up on what happened in Episode 11. As always work continues on the great pyramid. While working on flattening the floor of the pyramid I suffered back to back attacks by Creepers. While the damage wasn't too severe I did die in the second attack. Now that I had a rank of 0 I needed to earn some XP so I can continue enchanting and repairing my tools. I decided I needed to take a break from the pyramid and went back to my base to do some mining. I had two goals to work on while I was there, earn XP and find some diamonds. The last tool I repaired before the attack ate into my last stack of diamonds. You can't use a game plan when mining for diamonds, it's pure luck. For once my luck was doing OK as I found some diamonds quickly. 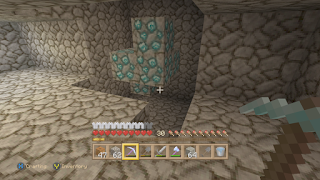 Whenever I find diamonds I always mine the stone around it just in case there is lava underneath it and the diamonds burn up. 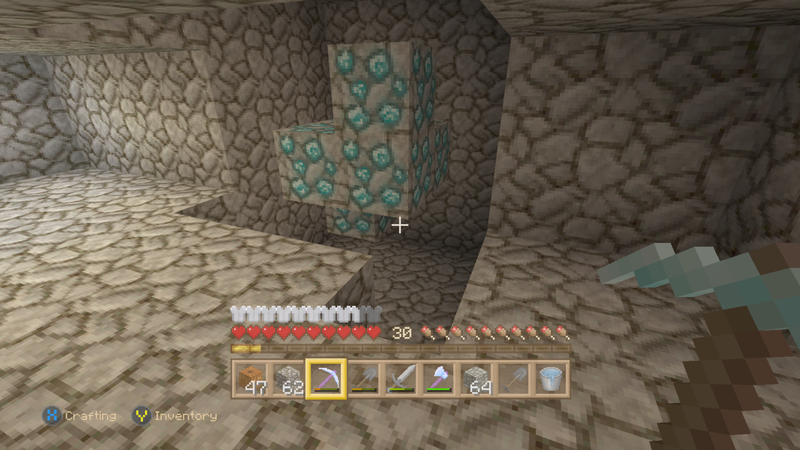 There is nothing more frustrating then mining a block of diamonds to have them disappear into lava beneath. 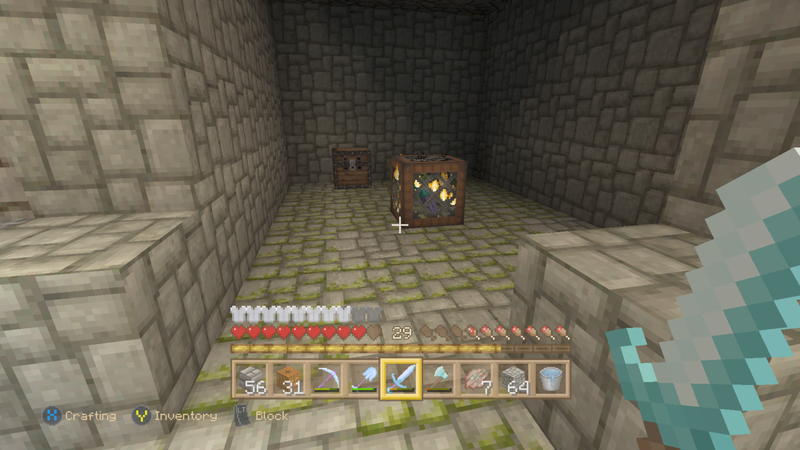 I also found my first dungeon and spawner in this world. The chest behind it contained two saddles and some miscellaneous food items. After spending awhile mining and raising my level I repaired my best ax and went back to the pyramid site. 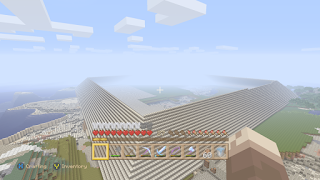 While looking around I decided that instead of the sandstone slabs I had begun putting around the outside of the pyramid I instead would put stone down and the top layer would be regular sand. I though the sandstone just wouldn't look authentic. 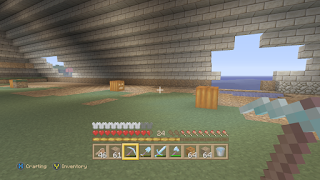 I'm digging down to layers so I can line under the weak sand with some stone as the sand won't protect you if a creeper goes off and you're standing under a big hole. In this picture, you can see exactly what I'm talking about. While mining away the top layer near the pyramid I come across a big lava pit. Creepers can destroy three layers down, especially if it's sand or dirt. As a matter of I nearly went head first into the lava. You always have to be careful when your mining. I've also worked on the pyramid itself. I've added some levels to the outside of the pyramid and some flattening of the pyramid floor. I'd say I've got around 75% of the floor done, the dirt layers. The sandstone slabs are probably around 25%.